Uncertainty makes us uncomfortable. When we are leading innovation, and our world is by its nature laced with unknowns, we naturally want to minimise uncertainty and we tend to tackle it with planning. When we write business cases, project justifications, proposals, in our desire to convince others of the validity of our plans, uncertainty is the last guest we want at our party. Every synapse strains to show stakeholders how we have made the right decisions, built a solid plan, thought things through. Make bold decisions, that’s what leaders do, right? Well, not entirely. More important is the quality of our decisions. Yes, as innovation leaders we need to make decisions, build a plan, and guide our teams. But though we feel the pressure to provide a detailed plan or business case, these are based on key decisions, and more critical is the ability to distinguish between when we have sufficient knowledge to make those key decisions well, and when we are actually making an underlying assumption. In the heat of planning, even good leaders can miss those subtle, but crucial, points where they have made an important assumption, but mistaken it for a fact, and then the all all-too-familiar traditional slow learning cycle begins: Design (based on the decisions you have made), then build, then test, then find out (late!) what has gone wrong, go back and fix it and build again. Lured by the siren-call of a pretty business case or project justification, the entire stakeholder group ignored the simple fact that at least some of the key decisions (which were made early to create a foundation for the plan), were made without the knowledge required to make those decisions well. The very complexity of “The Plan” made the underlying assumptions feel far more solid and factual than they really were. They were still assumptions. Every time a key decision transpires to have rested on a false assumption, a problem arises, often only apparent late in the cycle. Every time a problem arises, we must focus leader attention on solving it, and as problems based on inaccurate assumptions multiply, so do rework and the forces which pull us as innovation leaders to spending our time fighting these avoidable fires, generated by leaps of faith we did not even notice we had taken. Having initially spent much of our effort building detail into a plan which rested on assumptions, we now feel the frustration of being pulled from the detailed plan which felt “strategic” into a cycle of issue lists and slipping milestones. The risk is that now, instead of leading, we are pulled ever deeper into the weeds, where frustrated teams do silent battle with spikey managers to solve intractable problems on the fly. We made decisions early to create a foundation for our plan, but we built our plan on sand, and when the rains came it did not hold. Even if, through grit and sweat, the project recovers, it has been done the hard way, our energy and the energy of our teams spent inefficiently, and we have taken the long road to “success”. The very best innovation leaders understand this danger and make friends with uncertainty early; the very best sponsors and investors support them. The Rapid Learning Cycle approach, pioneered by Katherine Radeka, can be one of the leader’s sharpest tools. Used skilfully, it helps to build a framework that solves that crucial problem inherent in traditional stage-gate innovation management, which relies on an implicit (and often unconscious) collusion between stakeholders: In their thirst for predictability they accept the fallacy that your key decisions can and should be made very early in the process, and that these decisions can then accurately inform and drive the required actions and activities that lead to success. Rapid Learning Cycles recognise, and name, the fact that many of the key decisions we need to make have knowledge gaps which must be filled to make the decision well. The learning needed to close these gaps is pulled to the front of the process, the reality of uncertainty is embraced, and decisions are pushed to when then they can be good quality decisions. The cycle of assumption is broken, and where a prudent risk remains, we have looked it in the eye and recognised it as such. Rapid Learning Cycles help innovation leaders to spend their valuable time well on the most valuable things, in a framework of collective self-honesty where we tell each other the truth about what we know and what we need to learn. The Rapid Learning Cycles approach expects significant unknowns, and begins by explicitly naming the important decisions that need to be made, and by honestly evaluating the knowledge gaps which need to be closed before each key decision can be made well. Instead of making the decision early to gain a comforting, but misleading, feeling that the plan is complete, Rapid Learning Cycles name the fact that we don’t yet know enough, and pull the learning needed to the front. Our teams always work on what is actually most important today, closing the critical knowledge gaps, and our leaders are focused on the crucial decisions on which success ultimately rests. Leaders are now leaders, guiding activities and resources to generate the learning we need. They are strategic, managing the sequence and dependencies between key decisions, collaborating with sponsors in making clear-headed judgements about which knowledge gaps we can live with, what are the prudent risks to take, and what are the knowledge gaps that we need to keep firmly on the radar for further testing in a subsequent learning cycle. Avoiding the assumption trap, the fire-fighting slow learning cycle is broken, and the path to success is shorter because it faced the uncertain early. Teams are now owners. They are presented with a knowledge gap to close, and they have broad authority to research, think, and design experiments to close the gap. In a sprint-style visual management framework, they can align each player with where they can make their most valuable contribution, and they know that they are being trusted to deliver a valued and critical component of success. Using visual collaboration tools, they can share their approaches, experiments, and align with other teams, but they do not need micro-management and they do not need to waste time in endless status updates and plan revisions. Their job is, within a defined cadence, to report back on what they have learned, either closing the knowledge gap or learning what or who else is needed to do so, allowing leaders to effectively manage the decisions rather than the weeds. 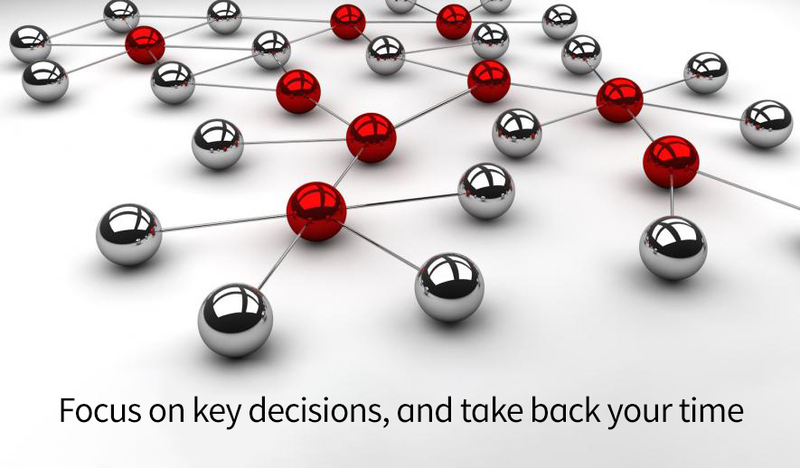 Informed decisions are now not only possible, they are the natural progression. Predictability actually increases, because our plans are no longer built on sand. The entire stakeholder group is enabled to make better quality decisions, and make an informed judgement of the level of risks being taken and whether these risks are prudent. Rapid Learning Cycles enable you to gain control, by giving up your traditional semblance of control, by meeting uncertainty in the flesh and realising it is actually your friend. You empower your leaders and your teams, from the most junior assistant to the most senior sponsor, to focus every day on what is most important, and take the shortest route to the best of all possible outcomes.